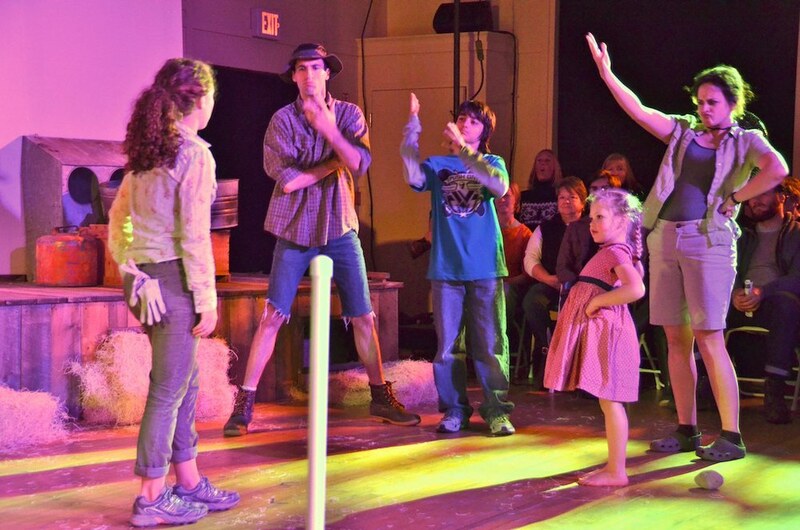 A full-length original play, Farms & Fables was developed through a multi-year collaboration with three family farms in southern Maine. During research, core artists participated in daily farm operations while conducting group conversations and interviews with partnering farmers. Our farm partners directly assisted in the script revision process, and some performed in the play. The script focused on relationships between farmers, the challenges of transitioning a farm from one generation to the next, and the realities of starting a new farm business. This project was in development from January 2008 through October 2011. The Farms & Fables artistic team maintained extensive written and photographic documentation of project research, development, and production. Peruse the archives on the OFAF blog. Today, today is the day of our long-awaited Load-In. I have been in the theater, what used to be the Great Room at Camp Ketcha, all day and I imagine I’ll be here well into the night. All around me there is activity. Seth and Heather building and testing at the tech table, Perry and Chris rigging The Barn, Gregg hanging curtains in the hall’s massive windows to block light during our matinee performances. I took a break about an hour ago and went out for a walk on the Camp Ketcha grounds. I was in need of fresh air and the last of the day’s light. There’s a trail across the fields that heads out through the camp’s ropes course in the woods, past a pond and across the Libby River Farm, owned by the Scarborough Land Conservation Trust, ending at the Scarborough Marsh. The Libby River in its current honorific is named for my ancestor some twelve generations back, a Mr. John Libby, who settled on Pine Point in 1632. When I left the room, I had no idea where I was headed or how long I would be gone. I emerged from the woods into a clearing with a stalwart pine on its southern border. I rounded a bend and passed through long grasses, bittersweet popping like fire to my left and right. Burning bush, deeper maroon and purple, hunched low in the cattails. I was careful to keep my feet dry. As I walked, I thought about journeys. Discoveries made, unexpected surprises: a stand of birch with a dozen leaves remaining on their topmost branches, saluting the season, beckoning nightfall. A nervous Penny Jordan staunchly delivering her lines and creatively concocting solutions through a minefield of dropped cues. Eddie Benson and his daughter Kati, in my rehearsal room, coaching our actors in the staging of a cow chase. I thought about journeys: how we start without knowing, how we traverse multiple subtle landscapes, how we find comfort in reminders of home. I walked steadily across land once roamed by generations of my own family, unsure of my goal but purposeful in uncertainty, remembering beginnings, honoring passage. Nearing the marsh at the end of the trail I felt my pace quicken with anticipation of the finish and when I reached it I discovered: an observation deck. A place to gain perspective. Why do I make community-based theater? What has been the value of my Farms & Fables journey? Only a bit of perspective. Only a chance to see, with eyes that are cleared with wonder: a complex, delicate, and vital ecosystem of human relationships, and a collaborative creation of great beauty. Initial funding for Farms & Fables was generously provided by the Ella Lyman Cabot Trust.